Numerous entities routinely publish benchmarks for various costs associated with photovoltaic systems in the United States. In the past year among the groups issuing reports have been the Department of Energy (DoE), National Renewable Energy Laboratory (NREL), Lawrence Berkeley National Laboratory (LBNL), Rocky Mountain Institute/Georgia Institute of Technology, Solar Energy Industries Association/GTM Research and Citi Research. The reports track the costs of cells, modules, installed costs, soft costs, balance of system costs and labor costs. 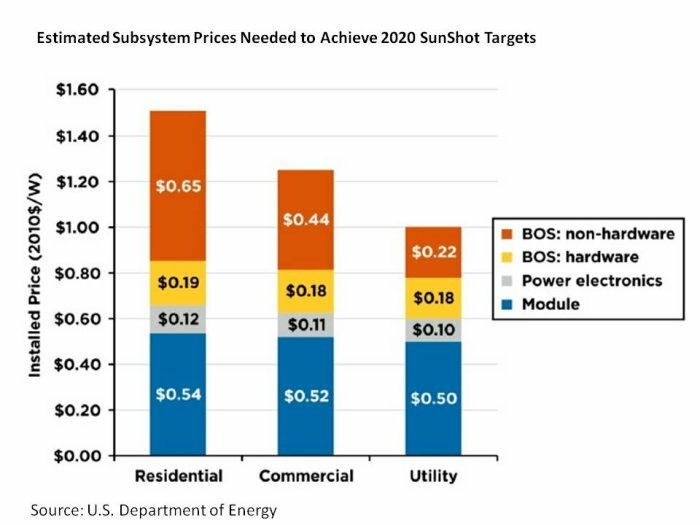 The overarching goal or target, as defined by the Department of Energy’s Sunshot program, is to make solar energy cost-competitive with other forms of electricity by the end of the decade. To do that, installed costs need to reach $1.50/W, $1.25/W and $1.00/W for residential, commercial and utility-scale systems, respectively, by 2020. These various reports examine the historical price data. While some use the most current data available, others focus on projects that were installed during the previous 12 to 24 months. Due to a combination of technological innovation, improved manufacturing processes and growing PV markets, there has been a continued dramatic downward trend in PV prices over the past year. As a result, the reports that reflect price quotes in the latter half of 2012 are not representative of the price of projects installed more recently or being quoted in 2014. National Renewable Energy Laboratory (NREL) found that third-party ownership added $0.78/W for residential systems and $0.67/W for commercial projects. However, the report also noted the benefits of third-party financing arrangements include additional services (i.e. maintaining systems and applying for incentives). The Solar Energy Industries Association/GTM Research reported that the average cost of a completed PV system dropped by 16 percent over the past year (2012-2013) to $3.00/W. Citi Research projects by 2020 the cost of a solar module will decrease from $0.97/W to between $0.25 and $0.53/W. The installed cost is projected to drop from $2.40/W today (2013), to between $1.12 and $1.40/W in 2020. Lawrence Berkley National Laboratory (LBNL) found that among the roughly 50,000 residential and commercial PV systems installed in 2012, the median installed price was $5.30/W for systems ?10 kW, $4.90/W for systems 10-100 kW in size, and $4.60/W for systems >100 kW. (The installed cost represented here is the up-front price paid by the PV system owner prior to receipt of any incentive or tax credit).